Become James Bond in his latest adventure and destroy the evil drug smuggler Sanchez. Guide 007 as he fights it out on Cray Cay over Miami bay and underwater on his way to the final confrontation in 18-wheeler fuel tankers. Defeat Sanchez and give Bond what he wants - REVENGE. Timothy Dalton plays James Bond in the movie. But in this adventure, you're the star. The powerful drug czar Sanchez has murdered your best friend's bride. So you're out to take him down. Show no mercy as you battle him on land, at sea and in the air. You'll need to take the controls of helicopters, planes and tankers. Perform death-defying stunts in midair. Even water-ski in your bare feet! The breakneck action closely follows the James Bond film. 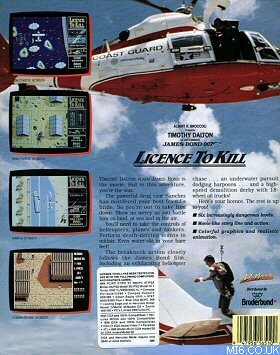 Including an exhilarating helicopter chase ... an underwater pursuit dodging harpoons ... and a high-speed demolition derby with 18-wheel oil trucks! Here's your licence. The rest is up to you! Movie-like story line and action. Colourful graphics and realistic animation. 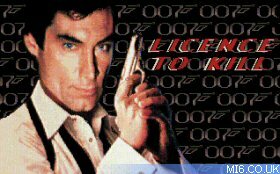 "Licence to Kill" was released on April 20th, 1989 by a company named Domark - named after it's founders whose names were Dominic and Mark. The company no longer exists after it was bought out along with United States Gold & Core design and became part of the Eidos video game company which still exists today. The developers "Quixel" were credited on the title screen with a small word in the lower left corner. 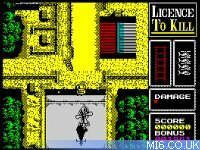 Domark published a number of James Bond 007 licensed games during the late 1980's ("A View To A Kill" (1985), "The Living Daylights" (1987), "Live And Let Die" (1988)) and into the early 1990's ("The Spy Who Loved Me" (1990), "James Bond: The Duel" (1993)), but 1989's "Licence To Kill" is regarded by many as their finest hour. Unlike the movie, the game proved more successful than other recent 007 outings, receiving positive reviews and selling well above expectations across all platforms. 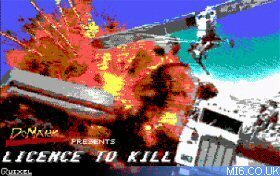 The game consists of six scenes based closely on parts of the movie, with the action taking place in a helicopter, on foot, in mid-air, underwater, on water-skis and behind the wheels of a Kenworth tanker truck! The diversity of gameplay and level design is to be commended, especially during an era when movie tie-in games were largely platform based. Smooth controls ramp up the enjoyment factor, along with a great soundtrack by David Whittaker and detailed graphics by Tony West. The difficulty is set just right - tough enough to make the relatively short game last a good while. After completing the game, the difficulty gets increased to prolong the game's life-span. 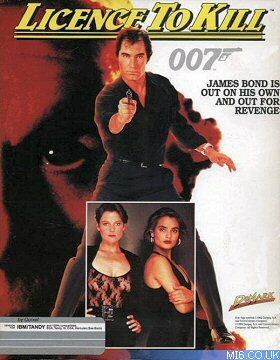 Viewed within the era that "Licence To Kill" was released, Domark's fourth 007 outing (although obsolete in today's next-gen console world) raised the bar for future Bond games and can now be looked back upon as one of the series' more robust titles. Above: Amiga (left) and Amstrad CPC (right) screenshots. He's used to getting what he wants....This time he wants revenge. He's big. He's back. He's James Bond 007.....and now in a thrilling adaptation from the new movie Licence to Kill, you can take his place. 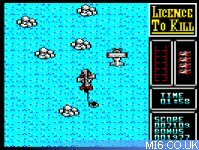 Licence to Kill is a multi-level, multi-role game - you take the controls of helicopters, boats and tankers, perform some death-defying parachute stunts and take to the seas for a spot of barefoot water skiing. A steady aim and steady fire is needed - shoot from the hip and take out the 'baddies'. James Bond in Licence to Kill.....appearing shortly on a small screen near you. 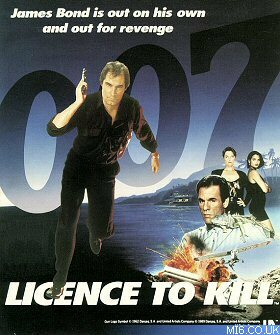 Tengen developed a Nintendo Entertainment System (NES) incarnation of "Licence To Kill" based on the PC version, but it was never released. Programmed by Simon Nicol, the completed game was not published by Domark as they deemed too much time had passed since the original release on other platforms. Some versions play the theme from "You Only Live Twice" when you die. On every level, you'll have a control panel on the right hand side of the screen. You'll always be shown the number of lives you have left, and you'll also see important information about the level you're playing - number of bullets, amount of oxygen, time remaining, etc. At certain times, a remainder will appear telling you to jump, shoot, etc. Press "Fire" to do this. Once you have mastered each scene, improve your score by going round again - but this time it will be much harder. Scene 1: Bond and his partner, Felix Leiter, swoop low in their helicopter over Cray Cay to prevent Sanchez from escaping in his jeep. Avoid the obstacles (Of varying height) and shoot out the gun emplacements as you gun down the jeep. Remember, the faster you fly, the lower you go! The control panel shows how much your helicopter is damaged and how high you're flying. Scene 2: Bond leaps into action and sets off on foot to catch Sanchez. Watch out - many of Sanchez' henchmen have been deployed to ambush you. Your wits and your 15-shot Beretta can make the difference! Duck and shoot your way through while collecting extra magazines from the gunmen you take out. Watch out for the oil barrels as they explode after four direct hits. The control panel shows how many hits you've taken. (Five hits is worth a life) and how many magazines/bullets you have. Scene 3: Bond is lowered by rope from the helicopter as Sanchez attempts to escape to Cuba in his aircraft. Guide 007 onto the back of the dodging plane and attach the tow rope. Remember, Bond can't jump to the plane if you are in the clouds! Position Bond directly over the tail of the plane and press the fire button to "lock-on" - it's not as easy as it sounds, and time is running out! The control panel shows how much time you have before Sanchez leaves U.S. territory. Scene 4: 007 dives into the thick of it as he interrupts a "drop" by the drug smugglers. 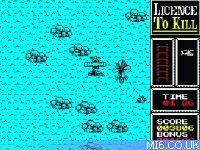 THey set off in hot pursuit and Bond must swim for his life as divers are launched against him. Swim underwater to stop the boats from firing. Kill enemy divers (and get their harpoons) by pressing the space bar/joystick button when you run into them. Destroy the drug caches for a bonus. When the seaplane appears, line up with one of the pontoons and hit it with a harpoon to move to the next level. The control panel shows your oxygen level - you can stay underwater only until your oxygen runs out. Scene 5: You're off in a high speed chase as you water ski barefoot behind the seaplane. Watch out for the rocks and floating objects that can send you for a spill! Weave your way to the seaplane to gain control and escape! Scene 6: You have destroyed Sanchez' drug factory only to find he has escaped you once again. You must prevent Sanchez reaching the border with his drugs haul stored in 18-wheeler tankers. Position your stolen crop-duster above the truck until you see the square target; press "fire"/space bar to jump into the truck. Use this truck to destroy each and every tanker in turn until you reach the final tanker containing Sanchez. The control panel shows where your truck has been damaged. Drug Busters: You start off in a helicopter and there is a jeep on the run. There will be lots of buildings shooting at you in this level but they shouldn't cause much damage. When the level starts off it's recommended to gain as much altitude as possible (Down Arrow) and turn to the left. Usually, if you don't, 5-10 bullets go into your helicopter. You can destroy the jeep if you want. If you do, it makes the 2nd level a LOT easier. Do your best to dodge the enemy fire. When you reach the end of the level turn to the right, wait for a white box with JUMP on it to appear and press Space Bar. 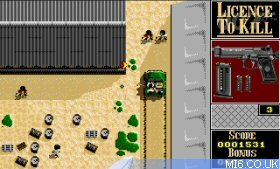 Drug Busters II: If you destroyed the jeep on the first mission, it's gone in this level and makes it a lot easier. On the right menu, if you see two or three bullet holes that means you've been shot two or three times. If you are shot five times by the enemy you lose. A good strategy in this level is just to run and dodge the bullets as best as you can. When you reach a wall of barrels shoot a barrel five times and it will blow up. Cross the street, kill the bad guys at the helicopter if you want and enter the helicopter from the right. Note: if you enter it from the left the mission does not end. Let's Go Fishing: You're back in the helicopter and Sanchez is escaping in his private plane. You have two minutes to lower yourself to the tail of the plane and hook a rope onto the tail. If you unsure if you are above the tail and are allowed to tie the rope around, look for a small red box. When you do see a small red box, press Space Bar and Bond will automatically pull the rope around the tail and "reel him in" as Felix Leiter put it in the movie. You will now parachute into the sea. Water-Ski: You are in the sea now. Kill an enemy diver, take his harpoon gun, and shoot it at the landing gear of the plane and go water skiing to the plane. Note: If you have beaten the game and are playing the game for the 2nd time in a row people in the boat will be shooting at you with automatic sub-machine guns. So, stay near a raft and wait until a diver dives into the water. When you get near a diver, press space bar and you'll get his harpoon gun and a spear. Press the up arrow to dive underwater and catch up with the plane. Note that you can only swim underwater for about five seconds. When you get to the plane you will only be able to see the end of it. Get your harpoon ready and fire at the landing gear. Now the divers and boat will be gone and you will have to control Bond and dodge the obstacles in your way. The obstacles are rocks and yellow rafts. If you crash into them you lose a life and have to do the level over again. 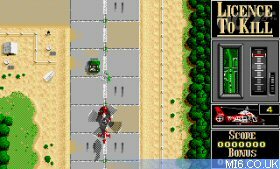 Tanker Attack: This final level is quite easy. Currently, you are controlling your friend Pam's Cessna and you have to jump down on the oil tanker and hijack it. The hijacking happens automatically. Note that when you hijack the oil tanker you start to slowly slow down. When you hit 0 MPH you lose the mission. What you have to do in this level is destroy all the oil tankers and destroy all the jeeps. A tip for the jeeps is just run them over - they'll blow up automatically. As for the oil tankers, drive straight and hit the right or left arrow rapidly. The controls are very sluggish in this level. Be careful not to go off the road or you will receive damage, and lots of it. If the driver compartment detaches from the drug compartment you'll have to destroy that part of the truck too. A good tip here is just ram the oil tankers and if they get behind you hit the brakes and they should ram into you, and blow up. You probably won't lose much health. The final oil tanker contains Sanchez and when you finally blow up the last oil tanker just keep driving along until the speedometer reaches zero.